The institute has limited complimentary parking available. The main guest lot is in front of the building, accessible via Cesar E. Chavez Blvd. ; the same entrance as the Tower of the Americas. The institute’s lot entrance is before the guard station to the city lot. UTSA Parking tags are typically honored on the premises. The staff lot includes A and B parking. Exceptions include special events such as festivals, and UTSA football season. 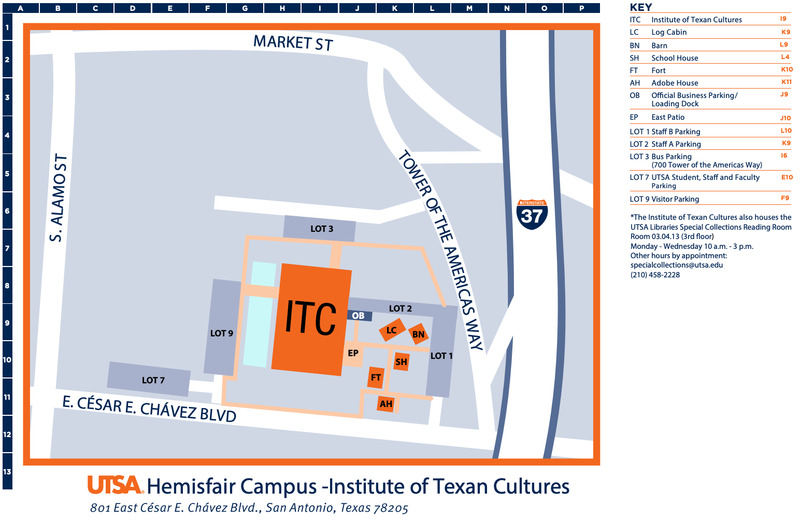 Complimentary parking for bus tours visiting the Institute of Texan Cultures is available. School groups that require additional vehicle parking are encouraged to use the front visitor lot. Please call in advance if you have concerns about the availability of parking spaces (210) 458-2246.